This was a quick little boy quilt that I put together last week. I purchased this panel last summer in Phoenix. Last week I added the yellow borders and quilted it. The quilting is not precision work! I started using a ruler and the extended base on my machine. However, the backing I chose created too much drag in combination with the ruler base. So I decided to just freehand everything. I roughly quilted around the vehicles and added some contour lines into the landscape. For the backing, I purchased a fuzzy throw blanket at a local discount store for $7.99. It is extremely soft and probably a third of the cost had I purchased yardage. You can see it has some color variation in it. I’m good with that. Yes, it is every bit as soft as it looks! You have to be very careful not to over stretch the backing when working with this stuff. I was not entirely successful in that but I imagine most little boys won’t care! I used a low loft poly batting and Glide thread. I had a lot less trouble with the quilting on this than on the Spider-Man quilt I did last summer with the same type of backing. I still don’t love working with it though! I would want to do a few more practice pieces with this before I would use it with a quilt top I was in love with. 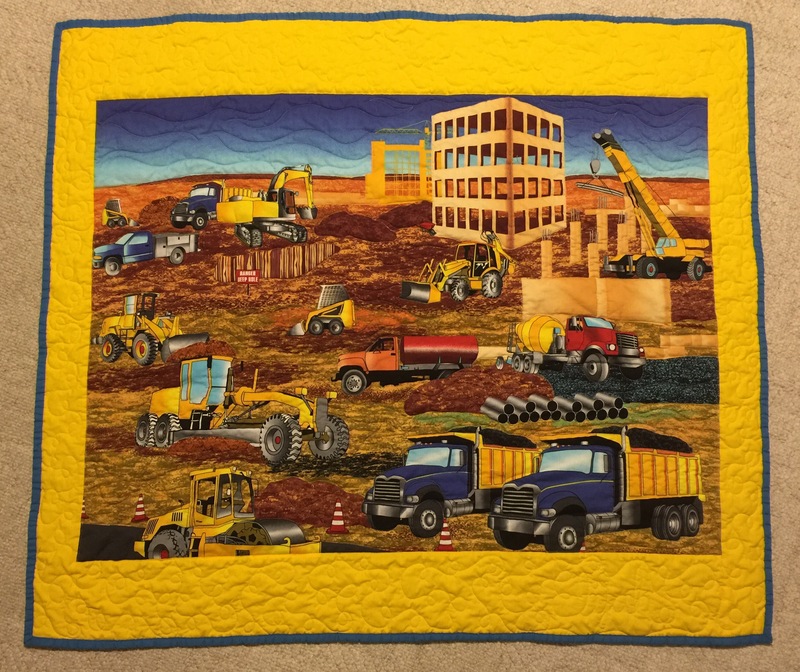 This entry was posted in Baby Quilts, Finishes, Machine quilting, Uncategorized. Bookmark the permalink. This is so sweet. 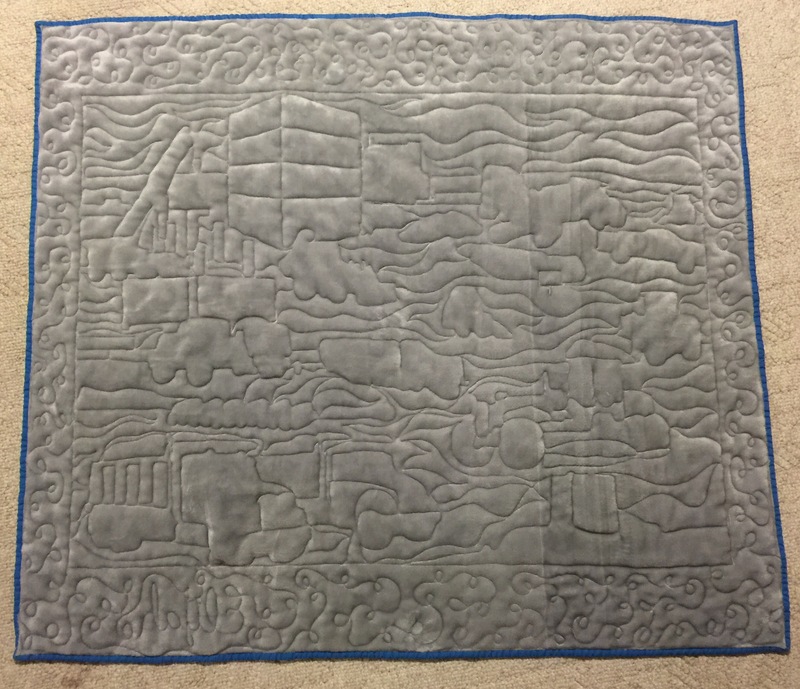 Good call on the quilting — it looks great. Well you might not be in love–but it will be loved for sure. I really like how the quilting makes an abstract design on the back. What a great idea for the backing! The yellow border frames it so well! Looks good. Some little boy will love this. 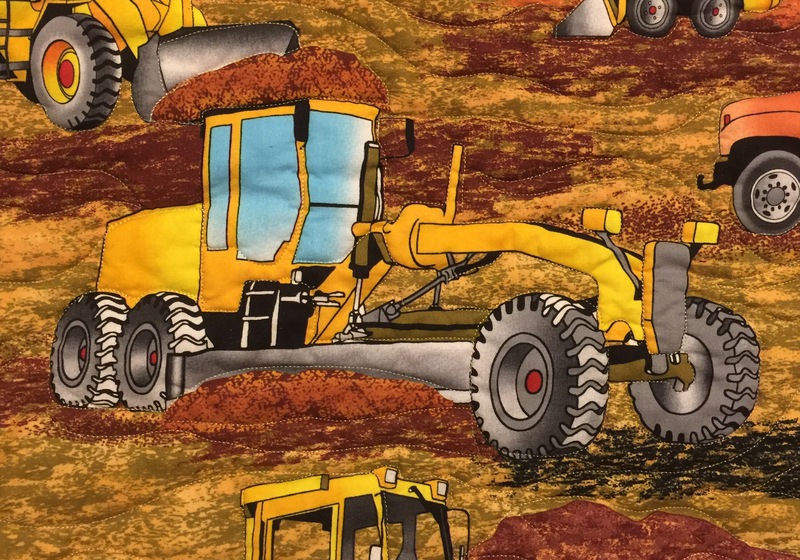 I’ve often wondered about using those cheap fleece blankets for backing. Will have to try. Did you use any batting?